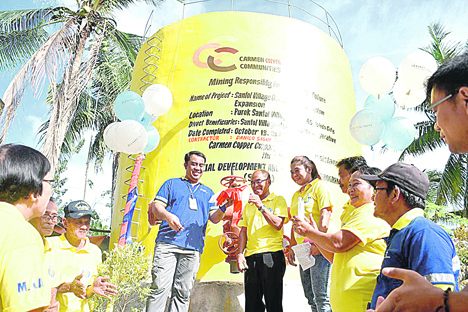 Carmen Copper Corp. has formally turned over a 75,000-liter capacity water reservoir to Santol Village Multipurpose Cooperative that can accommodate 300 more households that can now access clean water. Carmen Copper officials formally turn over the 75,000-liter capacity water reservoir that can accommodate 300 more households to members of the Santol Village Multipurpose Cooperative. In the upland barangays where water is scarce, access to water is crucial to good health and economic development, officials of the mining firm noted. In Toledo City, the households in Purok Santol Village, Barangay Don Andres Soriano will gain access to clean water after the addition of the reservoir. Carmen Copper, thru its Social Development and Management Program, formally turned over the water system expansion project to the cooperative in a simple turnover ceremony, allowing Santol Village MPC to extend its services to around 1,800 individuals. The cooperative water system currently serves 192 households or more than 1,000 residents in seven sitios of Barangay Don Andres Soriano. The project is in support of the United Nations Sustainable Development Goal No. 6, which is ensuring the availability and sustainable management of water and sanitation for all. “We’ve waited 20 years for this expansion. In the past, we cannot accommodate more requests because our previous capacity of 40 cubic meters [40,000 liters] just cannot cope with the demand,” said SVMPC Chairman Ernesto Largo. Due to limited water supply, the cooperative’s water system operates thrice daily only. The additional capacity would also mean additional income for the cooperative, which currently collects P40,000 to P50,000 monthly before maintenance and operating costs. “This for sure will make us more sustainable and profitable in the future. But what is more important is that more residents will get access to clean water. And it is all thanks to Carmen Copper with the support of the barangay council,” Largo said. “Thank you Carmen Copper and SDMP for looking after the welfare of the public by ensuring that we have access to one of man’s most basic necessities,” he added. Carmen Copper, which sources bulk of its water from the Malubog Dam for domestic and industrial use, also supplies hundreds of thousands of liters of water per year to the Toledo City Water District to augment its supply. To date, Carmen Copper has distributed 3.4 million cubic meters of fresh water to TCWD.